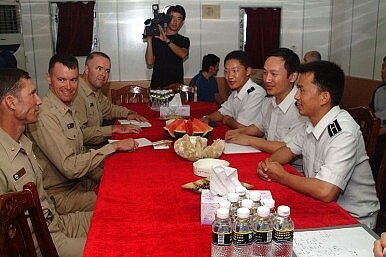 Talks between the US and Chinese militaries can be great. But dialogue can also reduce trust over maritime differences as well boosting it. Maritime security, especially in the East and South China Sea, remains high on the agenda of China, the United States, Japan and other regional actors. Incidents over the past two years have strained relations and then prompted official and unofficial dialogues, including a two-day conference of experts hosted by the Shanghai Academy of Social Sciences in association with the Carnegie-Tsinghua Center for Global Policy. The debate emanating from here in Shanghai at once showed the value of dialogue, but also its limitations. While Chinese and US officials attempt to build on the fragile edifice of maritime cooperation advanced earlier in May through high-level military and civilian talks, they might do well to reflect on the distinction between conflicts of national interest and conflicts based on insufficient understanding. As they know, dialogue won’t necessarily improve the former, but it does help to alleviate the latter. Indeed, Prof. Nan Li of the US Naval War College believes that dialogue can actually reduce trust when the differences are over national interests. This may be the case with respect to China explaining its active defence or anti-access and area denial strategy. For example, when someone as knowledgeable as retired Rear Adm. Yang Yi claims that it applies only to ‘Taiwan battlefield’ scenarios, US and foreign audiences are sceptical if not incredulous. Dialogue may be similarly counterproductive when the United States attempts to explain the air-sea battle concept. Although the concept remains nebulous, describing Navy-Air Force concepts of operations in the event an adversary like Iran tries to block the Strait of Hormuz elicits fears of a larger containment policy for those in Beijing. Also, because it was mentioned officially in the February 2010 Quadrennial Defence Review, many Chinese assume that air-sea battle is a real strategy, and not simply a concept. Similarly, China and the United States have fundamentally different interpretations of the United Nations Convention on the Law of the Sea (UNCLOS). One major difference is over whether and which type of military activities are permitted within the 200-nautical mile exclusive economic zone (EEZ) of a nation. China’s national interests and growing confidence lead to an expansive view of its EEZ and a narrow view of which military activities are permissible for a foreign nation to undertake within an EEZ. Such activities must be peaceful, and Chinese nationalists don’t consider intelligence gathering even by non-warships to be peaceful. The United States, on the other hand, not only contends that such information gathering is entirely within international law, but also that the United States has an obligation to periodically test the premise in order to maintain what it considers the global public good of freedom of the seas. But the practical maritime situation remains dynamic, and not simply a matter of interpreting international law. For example, China may, according to one Chinese scholar, invest in new high-technology to thwart US intelligence gathering on Chinese submarines. Thus, the incident over the ocean surveillance ship, USNS Impeccable in March 2009, when a People’s Liberation Army Navy frigate crossed its bow within 100 yards, may in future see the introduction of new Chinese technological means for denying the United States ability to monitor the opaque military operations of the People’s Liberation Army Navy (PLAN) .